Product prices and availability are accurate as of 2019-04-20 14:10:54 UTC and are subject to change. Any price and availability information displayed on http://www.amazon.com/ at the time of purchase will apply to the purchase of this product. 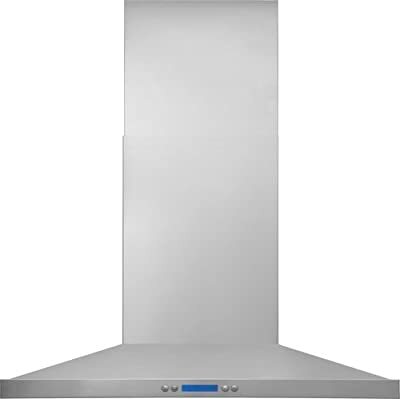 30" Range Hood with 600 CFM Dual-Centrifugal Fans and Washable Grease Filters This gorgeous stainless steel range hood will create a stylish modern look in your kitchen. The 3 fan speeds are ready for whatever level of grease and steam you can through at it. Cleaning is also a breeze with the dishwasher safe filters. Bright halogen bulbs provide lots of illumination for the cooktop surface. A must have for any modern kitchen. Features: Dual-Centrifugal Fans Washable Filters Halogen Lighting Specifications: Air Discharge: Vertical Exhaust Fan Capacity (CFM): 600 Blower Type: Dual-Centrifugal Exhaust Fan Speeds: 3 Work-Area Light: Halogen Lighting Exhaust Duct: Convertible Duct Diameter: 8" Round Filters: 2 Lights: 2 Shipping Weight (lbs): 64 Controls Electronic Controls with LCD Display: Yes Dimensions: 29-7/8"W x 19-11/16"D x 42-9/16"H (Height adjustable down to 24-5/8") Frigidaire is the brand you have come to know and trust. And for good reason. Year after year, Frigidaire has been the most reliable brand among leading appliance brands with the lowest number of service calls. With Frigidaire, you can be sure you'll receive effortless features and quality materials, giving you the highest quality performance for the life of your appliances.